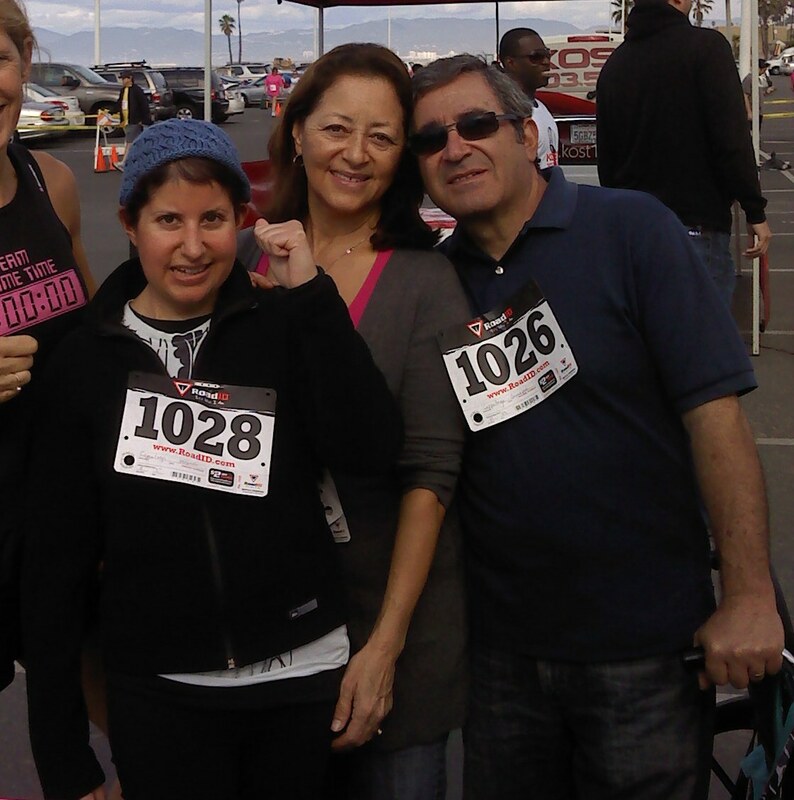 Race for Research is directed by a gal who lost her vibrant, handsome, full of life brother to brain cancer. She is doing something about that staggering loss. Every November she flies from the east coast to Marina Del Rey to stage the Research For Research at Dockweiler Beach. It drew a large crowd that kept us hoping as a timing company. The course starts atop the bluff and finishes on the beach with the PA announcing winners and the surf crashing in as the back drop. I could tell it was going to be one of those races I would have little chance to wander through the throngs of runners. But a family came to me. Their daughter’s chip had come off her shoe attachment. Sign has to read “no chip, no time”, but we do our best to scan through back up systems and find participant missing times. I was doing the typical ten things at once demanded as we run multiple computers and wired or wireless systems that report 5K, 10Ks, and kids races all at the same time. I really didn’t look up, but started searching our back up times when they approached me with their problem. “Any help you could give me on your approximate time?” I sounded robotic. The mom didn’t. In a hopeful voice she triumphantly reported that the mother and daughter synchronized their step to cross the finish line at the same time. She added. “It was a special step.” I looked up to see a mom and dad with their arms wrapped around their daughter. A wheelchair walker was propped beside them. I couldn’t tell the age of the daughter. She seemed juvenile. My own daughter tells me I tend to plow into social conversations without lead in or finesse. Being under time constraints at races is somewhat to blame for that. So I plowed in. “What’s the story of having to use a walker?” I even felt stunned that I had asked to blatantly. The father bowed his head. And the mom explained. Their daughter was proudly tackling her first year at a university when she called to let her parents know that her penmanship was getting sloppy. Her mom said she had always had perfect grades and detailed penmanship. She also let them know that she was beginning to drool. Diagnosis. Healthily in her early twenties she was diagnosed with a brain tumor. Operations and treatments to save her life left her learning to walk and speak again. And fighting. The pressures I thought I was under to accomplish the timing of the morning flapped away to meaninglessville. These guys were warrioring. The daughter explained through gestures and letters on her hand how hard it was to be so capable…so ready to start a young life…and so cruelly detained by the grave task of trying to survive. But she was going to give this, and every new thing in her life a fighting shot. Getting out and doing these races was a start. And a goal to enter the 2012 paraplegic Olympics. She was not going to sit back and wallow in her circumstances. She was going to take them on. Right on. Fight on Cappalunga family. Go, Veronica, go! This girl’s resume includes skilled with Machete! Maui, baby! Doesn’t get much better than a Run on the islands! There is something so worth discovering great destination races. I popped over to the islands to meet with the race director of the Maui Marathon and work out the details for timing their event. Chosen because it has the same flare that the Moorea Marathon in Tahiti has…not just a race, but a festively native theme sandwiched between surf, sunsets, resorts, and good food. Yum. Mahi Mahi smothered in vanilla, coconut sauce. Macadamia nut, powdered sugared pancakes. Miles and miles of running along the beach. A full marathon, run point to point from on end of the island to another. An out and back half marathon run along sparkling sea and white, sandy, palm tree-lined beaches. Oh my. And to top it off. A 5k and one Mile cheered event in town. Visit http://mauimarathonhawaii.com. You have got to come! September 17, 18 2011. The race director, Rudy, has spent a career competing, coaching, and training as a track decathlete. He puts on key track training clinics, is part of the Hawaii Elite Track Team, and also stages another island race that runs from the misty, lush Ono Valley down to the sea on Maui. This half marathon, 5k, 10k is held March 26, 2011. http://www.valleytothe seahalfmarathon.com. This is another great excuse to run on the island. How about this skill for a girl? Fresh papayas, mangos, pineapple…had to stop at a roadside stand in Kihea. There was a bouncy, beautiful girl that said once she graduated from college she came to MAUI for a few months…and was still here four years later. She gave us a run down on all the beneficial nutrients from each special island fruit and than plugged the natural purity of coconut water. That’s when she awed us the most with her proficient skill…at whacking away on a coconut with a machette! Every event could never happen without an army of volunteers. It has to be one of the challenges of an event promoter…to get adequate number of volunteers willing to depart from their cozy beds and be outside helping do a mountain of tasks from registering runners, to handing out t-shirts, to slicing oranges, to directing parking, standing out on course corners, and handing out water cups at aid stations. It has been a pleasure to meet such giving and cheerful people. Thank you for volunteering. I like accents. I love accents. I like voices. And the individuality of people. I get very little free time away from these events so I have made a conscious choice to meet and greet people at these events despite the pace and pressures that come with producing accurate data and times. I could hear a deep Italian accent gentlemanly greeting the runners as they worked through the registration process. I could tell he liked people. And his ability to comfortably laugh and interact with the public made the runner’s experience of picking up their bibs that much more enjoyable. I had to go down the line of volunteers and greet the voice. I am glad I did. The Italian man with two first names was delighted to share his love of his home country and told me the best way to experience it here was to dine at the Pizzacotta on San Vicente Blvd in Brentwood. 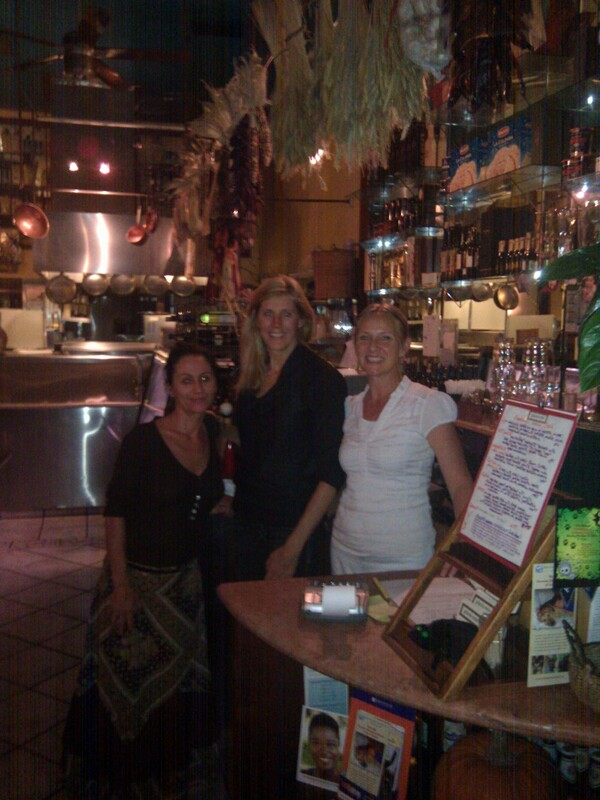 The small restaurant with huge delectable Italian dishes was run by two sisters. I had to go. And I got to experience what everyone said was so great about Italians. They love!!! They love their food, fine things, and fine people. And they savor and take their time. That is what time is for. I was coached that you had to give up conversation the minute the food arrives and savor slow bites of hot food. Something about the American Culture blows it when it comes to choosing to use their time. I am all about TIME. That is what I do for a living. But this was an evening learning how to use time very differently. How to savor. How to spend it with good company and good conversation. And I was stunned at how differently TIME tasted in this mode. Delicious. It was a gifted evening for me. I think I will SPEND more TIME using time differently. Conversation that evening tasted as equally good as the food and all courses. Pizzacotto is like stepping into a Italian family's kitchen.